Our Lancet paper on agreement between two methods of clinical measurment (Bland and Altman, 1986) has now been cited more than 29,000 times (29,208 citations on the ISI Web of Science, 25 October 2017). In 2014, Nature reported it to be at 29 in the lst of highly cited papers over all fields: The top 100 papers: Nature explores the most-cited research of all time by Richard Van Noorden, Brendan Maher& Regina Nuzzo. In 2003 it was reported to be the sixth most highly cited statistical paper ever (Ryan and Woodall 2005). To celebrate this and provide a bit of background for Tom Ryan, I compiled a history of citations of this paper. I updated it to mark the Nature report. As the Nature report showed, in 2014 our paper was the third most highly cited statistical paper, behind the Kaplan Meier survival curve and Cox's proportional hazards regression. Between 1986 and October 2017 there were 29,208 citations of this paper recorded in the Web of Science, 10,731 mentions of "Bland" and "Altman" in the topic, i.e. in abstracts or keywords, and 93 mentions of "Bland" and "Altman" in the title of papers. The paper was made available on the World Wide Web in 2000, and there is no obvious effect on citations. The figure also shows citations of our original 1983 paper in The Statistician (Altman and Bland 1983), in which we presented our ideas for the first time. The 1986 Lancet article was really only an attempt to publicise these to a medical audience. Incidentally, we chose the authorship of the first paper on alphabetical grounds, and then swapped for the second one. Bland got lucky, as the first author of the big hit, but in fact these papers are very much our joint work and neither of us takes precedence. The success of the 1986 paper led to continual enquiries from researchers about situations where the simple method did not apply. In response, we developed a series of more advanced approaches, which we described in Bland and Altman (1999). We both continue to get regular queries by email. I have included a number of replies to these questions on my website in an FAQ list. 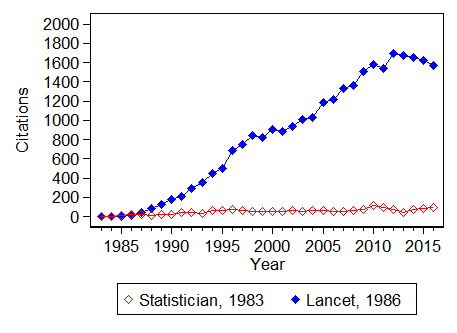 David Sharp, who was the Lancet editor originally responsible for the acceptance of the paper and for shortening and thereby improving it considerably, wrote little piece about citations (Sharp 2004). This contained the following advice for those seeking to be cited: "Stick to review articles or methods in the hope of striking occasional gold; the most cited Lancet paper (hereby acquiring yet another hit) is a method, 1 and second and third prizes go to publications of this sort too." Reference 1 was, of course, Bland and Altman (1986). This is also the message of the Nature report. Altman DG, Bland JM. (1983) Measurement in medicine: the analysis of method comparison studies. The Statistician 32, 307-317. PDF file by kind permission of the Royal Statstical Society. Bland JM, Altman DG. (1986). Statistical methods for assessing agreement between two methods of clinical measurement. Lancet i, 307-310. Ryan TP and Woodall WH (2005) The most-cited statistical papers. Journal of Applied Statistics 32, 461-474. Sharp D. (2004) As we said... Lancet 364 744. Last updated: 25 October 2017.